a radically different way of playing the guitar. makes every phrase a revelation. from the very best pianists or lute players." 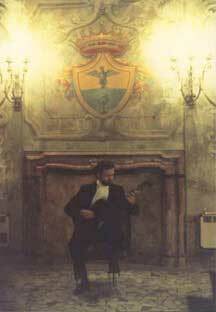 At left: Anthony in concert at Ducal Palace in Stresa, Italy, performing the Complete Sonatas of Anton Diabelli. This was the first complete performance of these famed sonatas in over 200 years. With past concerts at Carnegie Hall, Lincoln Center, Vienna International Center and the leading halls throughout the US and Europe, Anthony is a tremendous addition to any concerts series for solo, chamber and concerto appearances. Most concerts included some of his original compositions which means funding may be available through “Meet the Composer” (US only). Concerto appearances may be solo or include Jason Riley, performing Glise’s double concerto, “The Pendulum” for 2 guitars and chamber orchestra. For Anthony’s other concerti options, please contact The Aevia Group, Ltd.
Anthony may also be booked with Jason Riley - and your local chorale - for presentation of Glise’s “The Missouri Fables.” This is a tremendously popular, staged “living history” presentation based on a collection of surrealistic stories about life in Midwest America, written by Anthony. For a PDF with more information, click here. Anthony may also be booked as guest soloist with your local chorale to perform his Christmas Cavatina, “Stabat Mater Speciosa” (The Beautiful Standing Mother) for chorale (SATB) and solo classical guitar. For a PDF with more information, click here. Concert contract riders may also include community outreach programs, Artist-in-Residence programs (funding often available through your state arts council) and media appearances (radio & television). For a PDF with more information, click here. This is a general overview of the conditions traditionally set forth in contract by Anthony for commissioning his compositions. For a PDF in English with more information, click here. 5) The Nova Project® is an avant guard, electric ensemble founded by Anthony and Jason Riley. Further information about this exciting “classical prog” group is available on the front page.